This one is really included for fun and is for the more adventurous of you. Do it with an unattached female and it equates to the muscle & fitness guide to picking up girls. 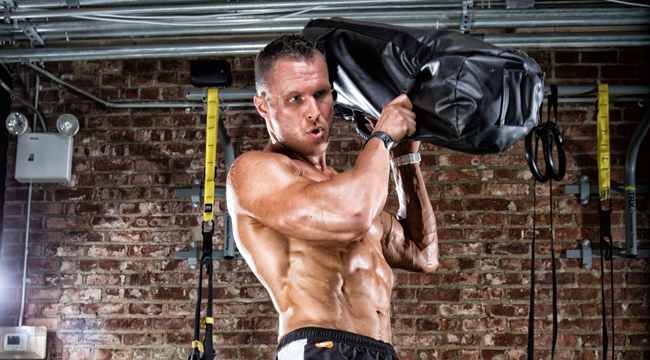 Similar to sandbag running, the fireman's carry requires running with additional resistance on your shoulders, only with more weight: a person rather than a knapsack. All you need is a willing (and gullible) workout partner. If one isn't available, you'll have to improvise -- Sandler has been known to use a boxing heavy bag with his athletes. Have your partner lie facedown across your shoulders, with one arm draped over your shoulder and the other down near your hip. "Don't try to take jumbo steps -- that could get you into an undesirable splits position pretty quickly," Sandler says. Warm up by walking for five minutes, then do a 25-yard run with your partner, followed by 30 seconds of rest, then repeat. Start with a total of 10 reps and work your way up to 30.